I don’t know about you, but these long breaks between new NCISLA episodes are killing me! If the upcoming Densi crisis is not enough for you, now we have to worry about Callen going on blind dates! Oh, the humanity of it all! So with my whining out of the way, it’s time to settle into a new episode by veteran script writer, R. Scott Gemmill who wrote one of the most heart wrenching episode for Deeks this season, Impact. Tonight we also have a new family member in the director’s chair, James Hanlon who did an amiable job behind the NCISLA camera in this episode. This week the team is investigating the death of two former military contractors who are found murdered in a dump heap off the side of the road. The case goes back to a previous mission… Impact where a journalist was killed to stop the publishing of his book on war crimes in Afghanistan. Surprisingly, Granger shows up in the Mission without Kensi. I thought Deeks was going to jump out of his skin when he first sees him….does this mean Kensi isn’t far behind? Unfortunately, that’s not the case and Deeks is in disbelief and not a little bit miffed that Granger has left her behind. We get to see a snippet of Kensi trying to survive the cold weather and an off-handed pick-up by Sabatino but it doesn’t look like she is coming home anytime soon. It’s interesting how she is sending messages back home to Nell. It’s our first insight into Kensi’s suspicions about Sabatino… could we be getting closer to the White Ghost? Now we know for sure it was Hetty who sent Kensi over there and even Granger doesn’t know why. It’s getting more interesting by the moment. While Sam and Callen are tracking down the one suspect who may know what happen to the dead contractors… Team Danger goes into action! Granger and Deeks form an unlikely crime fighting duo as they partner up in the field and I don’t think Hetty is too pleased. Deeks was hoping to get some intel into what is going on with Kensi but Granger is as secretive as ever. Team Danger was fun to watch, but I think Deeks and Granger only have a future together as a possible comedy team! We finally get to see a very intense scene with Nell and the suspect, Brown who was left in the boathouse after an interrogation. Nell certainly trusted her training in this struggle and although she wasn’t able to overtake Brown, she certainly caused enough damage to keep him from killing her while waiting for back up. I was amazed at her strength and tenacity and she may still make it in the field yet. Good girl! This was kind of a throw away episode to keep the White Ghost theme moving. The blind date, Team Danger and Wonder Woman Nell were all highlights in this very blah mission. Although the high spot for me was Granger turning into a stand-up comedian! Who knew? But it was kind of nice that the team doesn’t always have to be out there saving the world and that they can make smaller contributions to the planet when it comes to catching bad guys. At least we get a chance to catch our breaths as the intense drama of the final episodes of the season are unveiled. I’ve already started biting my finger nails. This is going to be a tough ride and I think we will ALL have to trust our training going forward! Sam knows his partner inside and out… probably better than any women ever will. 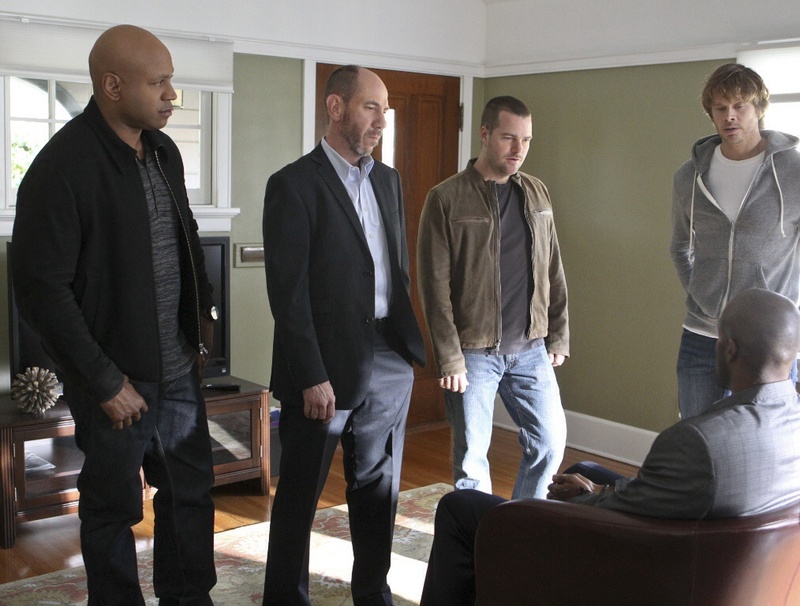 So now we get a glimpse into Callen’s life after work… not very interesting, huh? Well at least Sam was willing to put Deeks in the trunk… before he would have left him behind! We get to see Granger show some empathy towards Deeks’ concern for his partner… it was almost sweet. Hetty’s look on the other hand wasn’t so reassuring. If you do get cold, I’ve got a heating blanket… Really Sabatino? That was almost slimy… almost. Deeks is the best when it comes to protecting the little man or woman in this case. The way he saved the shop girl’s job was pure genius. Those two meerkats you got working in Ops are getting stranger. Oh boy, Granger is on a roll… who turned on his funny bone? The appeal of hot, dirty water… head cheese! LOL! Sam trying to fix Callen up on a date was another insight into their partnership. It’s a shame that he has to trick Callen into going on the date but he knows his partner well. I think Callen may owe him on this one! Eric: And both formerly employed by… any guesses? Deeks: Circue du Soleil? Applebee’s? You been there? Triple treat sampler… the place is delicious! Deeks (to Nell): Big stones, Jones! Deeks (to Granger): Kensi and I aren’t just partners. She’s my friend and I look out for her. So I’m asking you man to man, is there something I should know about? We are off again for another hiatus (sigh) but we will be back again in three weeks with our next review. In the meantime, check out Deeks Surf Log and Kensi’s Journal this week to read their reactions to what happened during this mission and long separation. See you then! Not enough comedy for my taste. Another great review Diane! Definitely not one of the best episodes of the season but it had its moments. I think like you said, the purpose of this episode was to move along the White Ghost mystery. Anyone else bored to tears by most of this episode? I thought the directing was mediocre. The dialogue was the only saving grace along with an interesting and yes, funny, sort of, Granger and a few glimpses of a worried Deeks. Not a lot to work with for ECO in this script, but it was really more of the Sam and Callen show and a great ep for Nell. Loved her fight, but had to suspend by disbelief that she could physically hold out that long against such a burly opponent…of course the stab wounds undoubtedly slowed him down. The blind date scenario was cute, but I don’t get it other than to give Callen a glimpse of normal life…can this relationship really go anywhere? Did I like this episode? Not really. I’m glad I’m not the only one who didn’t like it. After last night’s episode, I have several chat have concerns that have surfaced – things that have bothered me since “It’s a love story” actually. Notwithstanding what Shane Brennan has said about Densi’s “arc” this season and hiding Daniela’s pregnancy being just fine and dandy and how perfect the whole Afghanistan thing is working out, I truly think he’s kidding himself and trying to get us to go along! I honestly think that Daniela’s pregnancy threw them for a great big loop. I certainly agree that Daniela’s pregnancy should not have become part of the show, and I really don’t know of another way they might have handled it, but I’m really uncomfortable with the whole thing in general when it comes to advancing Densi’s relationship and the character development of both Kensi and Deeks. Two things have been particularly jarring to me and they both occurred/did not occur in “The Frozen Lake.” I’m sorry to say this, but I still, for the life of me, do not understand Kensi punching Deeks in the jaw! What were they thinking?! I was so shocked and confused by that that my perception of Kensi changed radically as I watched the rest of the episode; she lost credibility for me and the rest of the episode and the episodes since haven’t gone a long way to restore that credibility. That’s just not fair to Kensi or Deeks or their relationship. Why did Kensi lose credibility for me with that act of violence towards not only her partner but towards the man we were supposed to imagine she had lovingly spent the night with at last. And, therein lies the other problem for me. Their expressions of physical love are all in our imaginations. All we really needed was a lengthy kiss that was obviously not an undercover kiss and some whispered endearments that would qualify as Densi banter. But no, none of that, and so, in the final analysis, I’m confused, and Densi is confused as well, and I really want the powers that be to clarify what can be a wonderful relationship that helps to increase the show’s popularity over future seasons. As a final note, I agree that last night’s episode was flat, although I did enjoy Deeks’ moments because they showed as always what a great guy he is – his banter with Callen and Sam, his helping the girl keep her job, his scenes with Granger, where he gave as good as he got, his giving Nell his sweatshirt after the attack, and tugging at our hearts as the camera showed him walking out the door – alone. Excellent comments Laurel. Please keep coming back and adding your voice. Thanks, Jan! I really enjoy reading all the comments from our fellow fans of the show :)! So many interesting and thoughtful perceptions! Right Laurel, ALONE without Kensi. I was hopeful that Deeks could by chance see Kensi on the screen with Nell and Eric. But it broke my heart in the last scene. And by the way, I don’t like Sabatino. I agree with you – Sabatino is definitely not a favorite of mine either, but I’m not so sure he’s the mole. What do you think? I really don’t know. About the mole I prefer to be surprised by the writter. So I avoid myself thinking about that. Thanks for the entertaining review Di. You made me laugh several times. I’m just worried because I don’t know if my training will be enough to handle whatever horrors are in store for Densi later this season! What struck me most about this episode was how worried Deeks is about Kensi. He was right to show some anger toward Granger for leaving her without back-up. I loved that he offered to go himself, but I found Granger’s National Lampoon comment insensitive and insulting. Deeks may not have any experience in such a setting, but he catches on pretty fast most of the time. I would have preferred for Granger to point out that there’s no way an LAPD detective could be sent out of the country on assignment, leaving the door open for him to sign those darn papers and become an agent. What better reason to do so than to go and save Kensi? At any rate, I don’t know how he can be sleeping at all even if his PTSD is completely resolved. You captured it all again Diane! I found myself tweeting during the ep, which tells you something right there. Other than some brilliant one-liners, I struggled with this one. Don’t get me wrong, the Sam/Callen banter was the best in a long time, possibly ever. Granger trying to be funny was disconcerting to me. The National Lampoons line, it looked like ECO might have been trying to stifle a laugh. Love Nell helping “Sunshine” and seeing a very touchy-feely Neric. Her knife skills were great.. Can’t you see Kensi teaching that to her? And Nell in Deeks hoodie? Raise your hand if you were jealous! 🙌 I winder how much field work Nell will have when Kensi returns. As for our training, I feel very strong in my experiences of “always expecting the worst”! Most of all, please let them use Gunpowder as a code name for Deeks! Great review as always Diane. I was a bit disappointed that the episode was lacking the so called interaction between Granger and Deeks. I expected Deeks to be all over him demanding to know a bit more about his partner and all we got were two scenes. People have gotten frustrated by the fact that he used the term “friend” to describe his relationship with Kensi, but I understand it. What else could he have said? First of all they need to aknowledge their status with one another, and then make it public. I loved Nell in this episode. Like Deeks said she showed some balls. She trusted he training, didn’t panic and almost took out a guy twice her size. Way to go! I really don’t think Sabatino is the mole. It is way too obvious. Yes, he is hiding something but I can’t figure out what. I also like Booker. He should have more on screen time and I love how Kensi is the one who seeks humor. Oh Callen!You got fooled but it is for your own good. As much as I want to see him happy, starting a relationship based on lies is never a good thing. Thanks for all your comments guys. Can’t wait for a new episode even though it fills me with anxiety! Lol! Here’s what I have been thinking about. It’s not just the “what happens next?” that is concerning – it’s the big picture. I’ve been watching old episodes from current and prior season while there are no new episodes. The Densi banter is a huge part of the show and their relationship and really makes it fun. I think that can continue if they are a couple – might even be more fun. But what happens to that if the Densi relationship doesn’t work? When viewing old episodes it looks to me like lot of the banter they have had in the past just wouldn’t work or be possible if they had a failed relationship because there is a fair amount of sexual tension/innuendo in their banter. If that is ruled out, what happens?